Apartments Vilaveja are located on the island of Krk, in a quiet side street, not far from the town of KRK and the beautiful beaches. 200 meters away from the city of Krk promenade ..
We offer 4 modern and spacious apartments for 4-5 persons (4 +1) (about 55 m2). And 1 apartment for 3 persons ... (45 m2) .The apartments each have two bedrooms, fully equipped kitchen, bathroom, terrace, air conditioning and LCD satellite TV. For the guests of each apartment there is parking available in front of the Gaus, garden shower, bed linen, towels and tea towels and free WI-FI. House has a small swimming pool and jacuzzi for guests with sunbathing area .. Hours for swimming pool and jacuzzi (10h to 13h and 17h to 20h). Guests children are our luck .. for them we have children playground kids houses, cars, bikes, trampoline etc ... The house is only 200 meters from the city center. In the city center there is a market, shop, bakery, post office, exchange office, cafes, pastry shops, discos, etc. A gym is only 20m away. Man can take a walk on the beach doing (200 meters), where all kinds of fun for young and old. But you can just enjoy the peace in the shade of the pine trees. Just 400 meters away you can find some nice beaches and secluded coves. Nudist beaches are 800m. The hosts will help you to find the best selection of local restaurants, where you will find a small authentic Mediterranean cuisine, but also where to get discount for boat, motor, etc. get. They also offer transport from the airport to the apartment. 4 different sized apartments. The house is about 200 meters from the sea and the Krk promenade and therefore offers this green paradise and this relaxing silence. Welcome to Vilaveja - team: Vesna, Tiho, Tim and Adrian small. Discounts on fitness center BBk Krk 20 meters from the house ... Discounts on boat trips in old town Krk !!! Discounts for our guests on bike rent ..
What we especially appreciated were the useful tips of the extremely friendly landlord. A very nice, well maintained and perfectly situated apartment 5 min walk from both the town and beaches with almost all the facilities needed. With addition of a small oven the kitchen would be perfect. The house contains more apartments and in the one we had you have to pass through one of the bedrooms to reach the other making the apartment fine for a family but perhaps less suitable for two couples. Though it was not an issue for us one should also know that the terrace of this particular apartment is a pass-through terrace for other guests of the house too. Tiho, the host, is extremely helpful and informative about the good sights and beaches around Krk and goes far to fulfil your needs including lends out his bikes if you want to explore the city and surroundings. All in all we can highly recommend this apartment. Die Unterkunft hat uns gut gefallen. Die Nähe zum Strand und in die Altstadt ist super. Netter Vermieter, der sich um alle Belange sofort kümmert. Ein Schlafraum ist Durchgangszimmer, was für uns aber keine Rolle spielte. Schöne Wohnung und Vermieter waren sehr zuvorkommend. Hat uns sehr gut gefallen. Dear and nice family Love You!! You are always welcome to Us...:)!! Warm regards and all the best in lifes!! Schönes Appartement mit tollem Service und herzlichen Gastgebern. Leider gibt es nur ein separat Schlafzimmer. Das andere Ehebett steht im Durchgangszimmer. Die Reisezeit kurz vor Saisonbeginn war perfekt auch wenn einige Baustellen mal die Straße oder den Wasserzufluss zur Wohnung kurzzeitig abgeschnitten haben. Es gibt auch keinen Ofen aber ein Grill wird zur Verfügung gestellt, sodass man sich mir dem wichtigsten versorgen kann. Great host, who has a very warm and welcoming way to make you comfortable very quickly. The house is newly built and furnished. 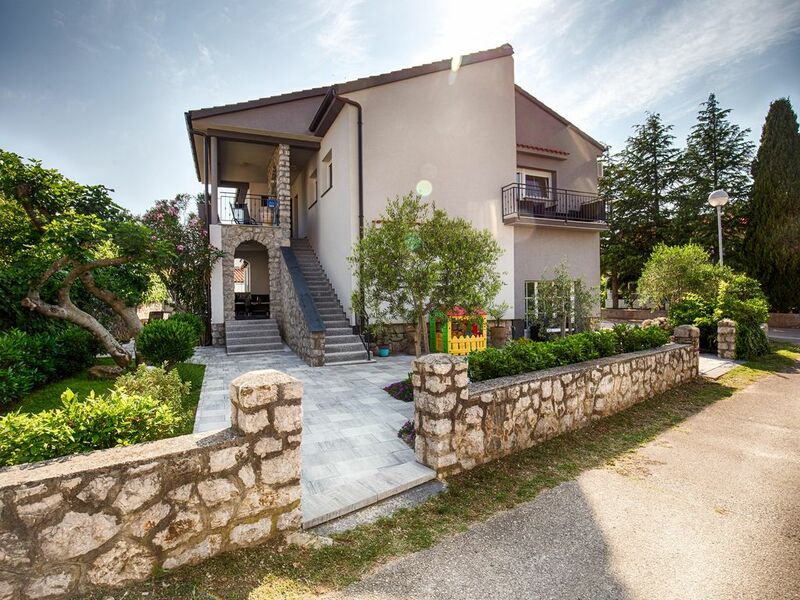 The Location is great, since it is in walking distance to Krk or nearby beaches. Anytime again, amazing find ! !